Was this ill-fated Victorian festival the first SF-themed "event"? Dr. Herbert Tibbitts, the founder of London’s West End Hospital and School of Massage and Electricity, had a special knack for fundraising. During the 1880s he had staged six elaborately themed bazaars, enlisting a committee of wealthy and socially prominent volunteers as organizers, stall-holders and hosts. Their “Ice Carnival” bazaar in 1890 had been a huge success, raising some £4000 for the hospital, and all eyes were on Dr. Tibbitts to see how he was going to top that in 1891. His chosen theme for that year, as it turned out, was based on a famous SF novel. First published in 1871, Baron Edward Bulwer-Lytton’s Vril: The Power of The Coming Race told of an American adventurer who encountered a race of winged, subterranean super-beings known as the Vril-ya. Their “power” of vril was described as being a force akin to electricity; channeled by special mechanical “rods”, it could be harnessed to almost any goal, either creative or destructive. Two or three Vril-ya children, the narrator warned darkly, could level any terrestrial city. By the 1890s, the mystique of vril had permeated Western popular culture. Some occultists even claimed that Bulwer-Lytton’s fantastic story of hidden “masters” and esoteric energies had been inspired by real (secret) history, much to the author’s annoyance and disdain. Riding the crest of this wave, however, Dr. Tibbitts and his committee set about designing their most imaginative fundraiser yet. 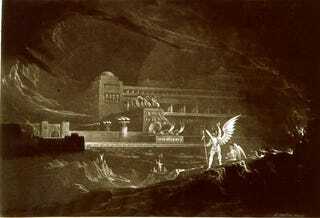 Scheduled to run between March 5-7, the Coming Race Bazaar would recreate the cavern-city of the Vril-ya within the opulent confines of the Royal Albert Hall in Kensington. Bulwer-Lytton had described Vril-ya architecture as being similar to that of ancient Egypt, Sumeria and India, and had even coined some words and phrases in the Vril-ya language; “gloon”, meaning town, “koom posh” (insincerity), “ana” (males), etc. Dr. Tibbitt’s early advertising for the Bazaar promised a spectacle unlike any seen before, with the women of his committee role-playing as Vril-ya “gy-ei” (females) in fancy dress and staffing “oons” (stalls) of suitably Oriental(ish) aspect. Those who wished to cosplay were urged to visit the emporium of John Simmons and Sons, Historical Costumiers to the Queen, to view an array of Coming Race costumes. Mannequins representing the winged Vril-ya would fly back and forth above the crowds and the event would also feature concerts, vril-themed magic shows and a grand feast. Most exciting, from the perspective of late-Victorian London society, was that Princess Beatrice of Battenberg would be in attendance on the first day of the Bazaar. Above: the only known illustration of the Coming Race Bazaar. Note the winged Vril-ya mannequin flying overhead. The grand opening (on a Thursday) was a great success. Visitors were impressed by the grand Pillar of the Vril-ya, modeled on Cleopatra’s Needle and bedecked with flowers and palm fronds. They could sample wares or try their luck at a variety of oons arrayed around the Pillar, whose proprietors vended music, handicrafts, paintings and perfumes. The Oon of Man-zi sold an assortment of dolls and satin cushions and Iva’s Oon of Aur-au sold petticoats. One tent-like oon was dedicated to fortune-telling - warning guests of the dangers of “poo-naria” (falsehood) - and one, cryptically signposted as “Krek’s Plunder of the River”, offered the novelty of fishing in an indoor pond. Yet another oon sold nourishing cups of Bovril, a popular, salty beef extract whose brand name was an homage to vril energy. A printed brochure helpfully included a glossary of the Vril-ya language, to the relief of those bewildered guests who were not closely familiar with Bulwer-Lytton’s fantasy world. The highlight of the day came when, following a short speech by Dr. Tibbitts, Princess Beatrice ceremonially accepted purses of charitable donations from the women of the committee. She also accepted one from a little girl who was so overwhelmed by meeting a real princess that she fled immediately after handing over her purse. Newspaper reviews of the second and third days, however, began to express “poopra” (disappointment, in the Vril-ya tongue) with certain aspects of Dr. Tibbitts’ science fiction extravaganza. Fashion reviewers were sharply divided; some gushed over the wildly eclectic Japanese, Elizabethan English, quasi-Indian and other garb worn by the committee-women and their helpers. The young lady role-playing as Princess Zee, a key character in the Coming Race novel, received universal acclaim for her uniquely creative winged costume of black satin and a silver flower tiara that glowed with electric lights. Other commentators, however, complained that they had expected all the Vril-ya gy-ei to be more authentically dressed. Perhaps the exotic costumes designed by John Simmons and Sons had been too outré, or simply too expensive, for the majority. Further, due perhaps to some mechanical difficulty, the celebrated India rubber Vril-ya mannequins - which had delighted youngsters by soaring, at unexpected intervals, high above the crowd on the first day - now simply dangled like marionettes in storage, their imperfections revealed by stark immobility. Some of the painted cardboard decorations were also looking a bit the worse for wear. A reviewer writing in the Leeds Times became vicious, remarking that, although the hospital was a worthy cause, the Bazaar itself was “a very sorry affair, inartistic, stupid ... a vulgar entertainment in the name of charity”. Meanwhile, several critics also had sharp words for the committee-women’s “unseemly gawping” and “tuft-hunting” (fawning) in the presence of the royal party, and commented that the crowds had become noticeably sparse when Princess Beatrice was not in attendance. The Coming Race Bazaar was unexpectedly extended an extra two days - “due to popular demand”, according to the organizers’ increasingly frantic announcements - but, by Monday afternoon, it was obvious that the event was in serious trouble. “The race,” one critic snarked, “would not, in fact, come; or not in sufficient numbers, or with enough money in its pockets, or with the requisite willingness to put its hand in them”. On Tuesday evening, the oons were dismantled, Krek’s Plunder was drained and the mystical gloon of the Vril-ya was quietly packed away. Sadly, the Coming Race Bazaar had failed. The problems may have been due to a lack of effective advertising or an over-crowded Spring social calendar. It’s also possible that the Bazaar somehow managed to be too twee for late-Victorian London high society. In any case, the event had landed deeply in the red. Adding injury to insult, this failure bankrupted Dr. Tibbitts, whose faith in the Bazaar had been such that he had funded it largely out of his own pocket. During his bankruptcy proceedings, it emerged that the purses presented to Princess Beatrice had been “topped up” with money borrowed from the stall-keepers, which was returned to them afterwards. This revelation provoked a minor scandal; even though there was no financial impropriety (the money, a less-than-royal sum of about £21, still went to the hospital charity), the impression had been given that each purse contained a personal donation from one of the committee-women. When challenged in court, Dr. Tibbitts meekly replied that he had been told this was the proper thing to do under the circumstances. What happened at DashCon 2014? Was DashCon 2014 a scam, or just poorly planned?